First manned test of the Apollo spacecraft. Although the systems worked well, the crew became grumpy with head colds and talked back to the ground. As a result, NASA management determined that none of them would fly again. Launched: 1968-10-11. Returned: 1968-10-22. Number crew: 3 . Duration: 10.84 days. Location: Museum of Science and Technology, Ottawa, Canada. Crew and spacecraft performed well throughout the mission. During eight burns of the service propulsion system during the flight, the engine functioned normally. October 14, third day of the mission, witnessed the first live television broadcast from a manned American spacecraft. The SPS engine was used to deorbit after 259 hours 39 minutes of flight. 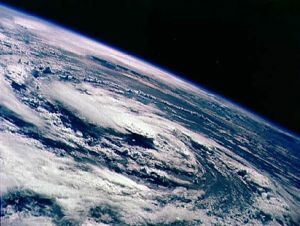 CM-SM separation and operation of the earth landing system were normal, and the spacecraft splashed down about 13 kilometers from the recovery ship (27.32 N 64.04 W), the U.S.S. Essex , at 7:11 a.m. EDT October 22. Although the vehicle initially settled in an apex-down ("stable 2") attitude, upright bags functioned normally and returned the CSM to an upright position in the water. Schirra, Eisele, and Cunningham were quickly picked up by a recovery helicopter and were safe aboard the recovery vessel less than an hour after splashdown. Although the systems worked, the crew became grumpy with head colds and talked back to the ground. As a result, NASA management determined that none of them would fly again. The first manned Apollo flight - Apollo 7 - sped skyward from Launch Complex 34 a few minutes after 11:00 on the morning of 11 October. Once Saturn IB 205 and CSM-101 (the first Block II CSM) cleared the pad in Florida, a three-shift mission control team - led by flight directors Glynn Lunney, Eugene Kranz, and Gerald D. Griffin - in Houston took over. 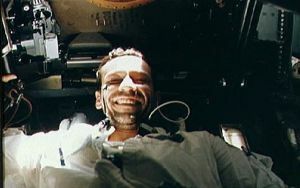 Schirra, Eisele, and Cunningham inside the command module had listened to the sound of propellants rushing into the firing chambers, had noticed the vehicles swaying slightly, and had felt the vibrations at ignition. 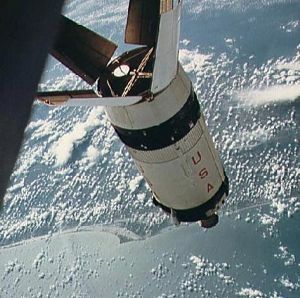 Ten and a half minutes after launch, with little bumpiness and low g loads during acceleration, Apollo 7 reached the first stage of its journey, an orbital path 227 by 285 kilometers above the earth. A few hours later, as the spacecraft separated from the S-IVB stage and then turned back in a simulated docking approach, Cunningham described the S-IVB, which would be used for rendezvous target practice the next day. 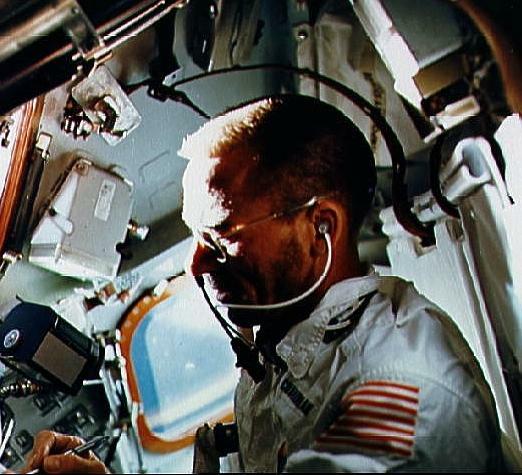 The spacecraft-lunar module adapter panels, he said, had not fully deployed - which naturally reminded Stafford, on the capsule communicator (CapCom) console, of the "angry alligator" target vehicle he had encountered on his Gemini IX mission. This mishap would have been embarrassing on a mission that carried a lunar module, but the panels would be jettisoned explosively on future flights. After this niggling problem, service module engine performance was a joy. This was one area where the crew could not switch to a redundant or backup system; at crucial times during a lunar voyage, the engine simply had to work or they would not get back home. On Apollo 7, there were eight nearly perfect firings out of eight attempts. On the first, the crew had a real surprise. In contrast to the smooth liftoff of the Saturn, the blast from the service module engine jolted the astronauts, causing Schirra to yell "Yabadabadoo" like Fred Flintstone in the contemporary video cartoon. Later, Eisele said, "We didn't quite know what to expect, but we got more than we expected." He added more graphically that it was a real boot in the rear that just plastered them into their seats. But the engine did what it was supposed to do each time it fired. With few exceptions, the other systems in the spacecraft operated as they should. Occasionally, one of the three fuel cells supplying electricity to the craft developed some unwanted high temperatures, but load-sharing hookups among the cells prevented any power shortage. The crew complained about noisy fans in the environmental circuits and turned one of them off. That did not help much, so the men switched off the other. The cabin stayed comfortable, although the coolant lines sweated and water collected in little puddles on the deck, which the crew expected after the Kerwin team's test in the altitude chamber. Schirra's crew vacuumed the excess water out into space with the urine dump hose. Visibility from the spacecraft windows ranged from poor to good, during the mission. Shortly after the launch escape tower jettisoned, two of the windows had soot deposits and two others had water condensation. Two days later, however, Cunningham reported that most of the windows were in fairly good shape, although moisture was collecting between the inner panes of one window. On the seventh day, Schirra described essentially the same conditions. The astronauts finally had a spacecraft large enough to move about in. During Gemini, crewmen had gone outside the craft in an exercise called extravehicular activity, or EVA. In Apollo, quite naturally, the abbreviation became IVA, for intravehicular activity. The crew adapted easily to this new free-floating realm. Schirra said, "All the problems we worried about the spacecraft picking up motions from the crew, no such thing. . . . You get to be quite a gymnast." And Cunningham later added, "The work is almost zero, and you can move any place you want to very freely, and you certainly don't need strong handholds to take care of it." The crew found exercise was important. At first, when the men slept in the couches their bodies curled up into the fetal position, which gave them lower back and abdominal pains. So they almost raced each other for a workout on a stretching device called an Exer-Genie, which relaxed their cramped and aching muscles. The crew slept well enough, but Schirra complained about round-the-clock operations that disrupted the normal, earth-bound routine. Sleep periods might start as early as 4:00 in the afternoon or as late as 4:00 in the morning. 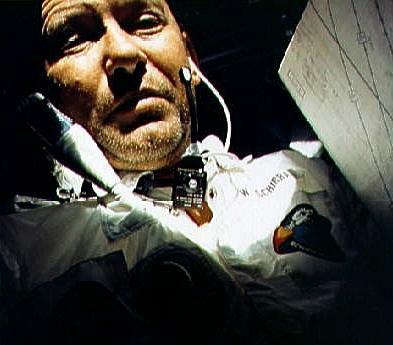 Slayton suggested that all three astronauts sleep at the same time, but Schirra said the machine was flying well and he did not want to make any changes. So Eisele kept watch while the others slept, and then he went to bed. Two sleeping bags were underneath the outboard couches (the center couch could be moved out of the way), and the crewmen could zip themselves into them, wearing their flight coveralls. The bags were not popular, because, they said, the restraints were in the wrong places. Cunningham preferred sleeping in the couch, strapping himself down with a shoulder harness and a lap belt. If two crewmen slept in the couches at the same time, however, one of them was always in the way of spacecraft operations. After the third day, the crew had worked out a routine that allowed all of them to get enough sleep. Although the astronauts had more than 60 food items to choose from, giving them about 2,500 calories a day, they were not happy with their fare. The bite-size food crumbled and stray particles floated around the cabin. They almost came to hate the high-energy sweets and tried to talk each other out of the more satisfactory breakfast items. Following his Gemini flight, Schirra had said that if he flew on Apollo he was going to take some coffee with him. And he did. During flight and later, the crew emphasized that space food was a long way from satisfying their normal table habits. 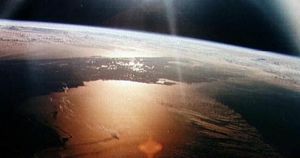 The astronauts did use the controversial television camera to show their colleagues in mission control and the public everywhere how they got along in their living quarters, operated the spacecraft, ate, and swam about in the weightlessness of space. When flight plan changes crowded their schedule, Schirra canceled the first of several planned television demonstrations. Slayton tried to change his mind, but the spacecraft commander told him sharply that there would be no show that day. The programs finally began, however, and the crew appeared to enjoy them, using cue cards - "Keep Those Cards and Letters Coming In, Folks" and "Hello from the Lovely Apollo Room High Atop Everything" - supplied by Michael Kapp, who also provided cassettes for their musical enjoyment. 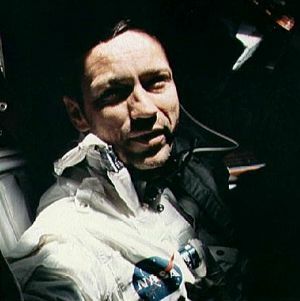 Several days before the mission ended, they began to worry about wearing their suit helmets during reentry, which would prevent them from blowing their noses. The buildup of pressure might burst their eardrums. Slayton, in mission control, tried to persuade them to wear the helmets, anyway, but Schirra was adamant. They each took a decongestant pill about an hour before reentry and made it through the acceleration zone without any problems with their ears. 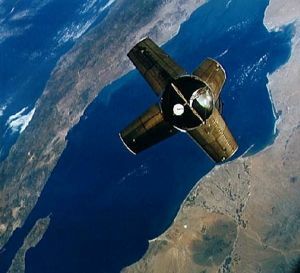 That "magnificent flying machine," as Cunningham called it, circled the earth for more than 260 hours. On 22 October, the crew brought the ship down in the Atlantic southeast of Bermuda, less than two kilometers from the planned impact point. On landing, the craft turned nose down, but the crew quickly inflated the air bags and the ship righted itself. The tired, but happy, voyagers were picked up by helicopter and deposited on the deck of the U.S.S. Essex . Family: Manned spaceflight. People: Cunningham, Eisele, Schirra. Country: USA. Spacecraft: Apollo CSM. Projects: Apollo. Launch Sites: Cape Canaveral. Agency: NASA Houston. Adapter panels deployed to 45 degrees would block the command link with the Apollo LEM - . Nation: USA. Program: Apollo. Flight: Apollo 7. Spacecraft: Apollo LM. 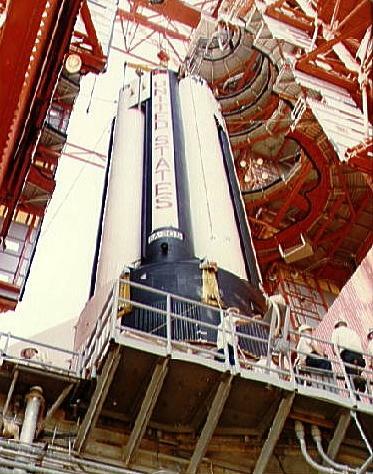 Because the adapter panels, when deployed to 45 degrees, would block the command link with the LEM, a command antenna system on the adapter was mandatory. MSC therefore directed North American to provide such a device on the adapters for spacecraft 014, 101, and 102. This would permit command acquisition of the LEM in the interval between panel deployment and the spacecraft's clearing the adapter. 1965 August 23 - . 1965 October 20-21 - . North American agreed to maintain mockups of both of the two blocks of Apollo CMs - . Nation: USA. Program: Apollo. Flight: Apollo 7. Spacecraft: Apollo CSM, CSM Block II. To support studies on equipment stowage, North American agreed to maintain mockups of the crew compartments in the two blocks of CMs. The contractor's effort would be geared for the first manned flight for each series of vehicles (spacecraft 012 and 101)..
Apollo MSC to rearrange flights after AS-204 - . Nation: USA. Program: Apollo. Flight: Apollo 7. Delete all experiments assigned to AS-205. Assign experiment M005 (Bioassays Body Fluid, modified version) to AS-205/208. Assign experiment M006 (Bone Demineralization) to AS-205/208. Assign experiment M011 (Cytogenic Blood Studies) to AS-205/208. Assign experiment M023 (Lower-Body Negative Pressure) to AS-205/208. Redesignate experiments assigned to AS-207/208 to AS-205/208. 1966 December 22 - . Launch Vehicle: Saturn V.
1967 March 15 - . Launch Vehicle: Saturn V.
1967 March 29 - April 4 - . 1967 April 17 - . Launch Vehicle: Saturn V.
1967 May 2-4 - . 1967 May 18 - . 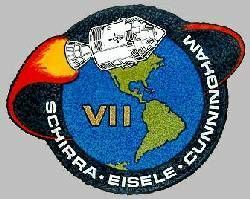 Crew members for Apollo 7 named - . Nation: USA. Program: Apollo. Flight: Apollo 7. Spacecraft: Apollo LM, CSM Block II. Prime and backup crews for Apollo 7 (spacecraft 101) were named, with the assignments effective immediately. The prime crew for the engineering-test-flight mission was to consist of Walter M. Schirra, Jr., commander; Donn F. Eisele, CM pilot; and R. Walter Cunningham, LM pilot. 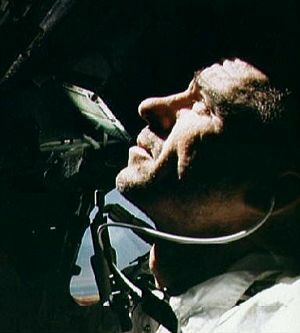 The backup crew was Thomas P. Stafford, commander; John W. Young, CM pilot; and Eugene A. Cernan, LM pilot. Names had been reported to the Senate Committee on Aeronautical and Space Sciences on 9 May. 1967 June 8 - . 1967 June 17 - . Apollo AS-205 experiments - . Nation: USA. Program: Apollo. Flight: Apollo 7. Spacecraft: Apollo CSM, CSM Block II. 1967 August 19 - . 1967 September 29 - . Apollo CSM 101 schedule agreed - . Nation: USA. Program: Apollo. Flight: Apollo 7. Spacecraft: Apollo CSM, CSM Block II. 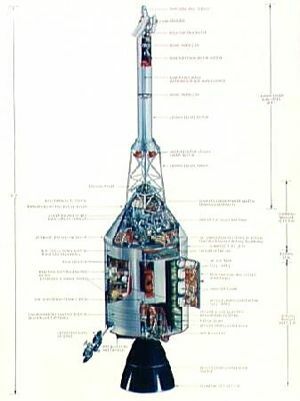 Key dates in the spacecraft 101 schedule were agreed to during a meeting of Samuel C. Phillips, Robert R. Gilruth, George M. Low, and Kenneth S. Kleinknecht with North American management: inspection of wiring, October 7, 1967; completion of manufacturing, December 15, 1967; delivery, March 15, 1968. In addition, several decisions were reached concerning certain systems of spacecraft 101. Among these, it was agreed that the entry monitor system would not be checked out on spacecraft 101. 1967 October 12 - . Northrop Ventura performance on Apollo parachute system discussed - . Nation: USA. Program: Apollo. Flight: Apollo 7. Spacecraft: Apollo CSM, CSM Block II. 1967 November 16 - . 1967 December 5 - . Apollo SM-102 static-fire test objectives - . Nation: USA. Program: Apollo. Flight: Apollo 7. Spacecraft: Apollo CSM, CSM Block II. 1967 December 12 - . 1968 January 9 - . Launch Vehicle: Saturn V.
Key Apollo program decisions required to certify the Apollo system design summarized - . Nation: USA. Program: Apollo. Flight: Apollo 7, Apollo 8. Spacecraft: Apollo LM. 1968 January 13 - . Results of an Apollo wire improvement study submitted - . Nation: USA. Program: Apollo. Flight: Apollo 7. Spacecraft: Apollo CSM, CSM Block II. Flight combustion stability monitor on Apollo 7 - . Nation: USA. Related Persons: Faget. Program: Apollo. Flight: Apollo 7. Spacecraft: Apollo CSM, CSM Block II. 1968 August 10 - . 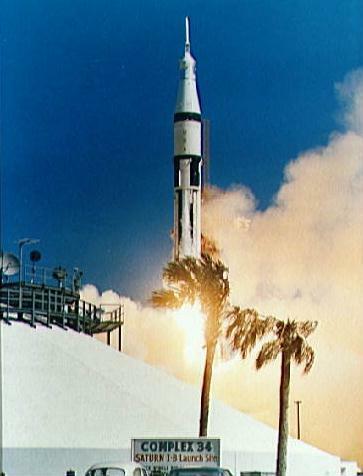 Launch Vehicle: Saturn V.
1968 August 13 - . 1968 August 16 - . Launch preparations for the Apollo 7 - . Nation: USA. Program: Apollo. Flight: Apollo 7, Apollo 8. Spacecraft: Apollo LM, CSM Block II. 1968 September 17 - . Requirements for the flight crew debriefing for the Apollo AS-205 mission - . Nation: USA. Program: Apollo. Flight: Apollo 7. 1968 September 24 - . Launch wind constraint for Saturn IB relaxed - . Nation: USA. Program: Apollo. Flight: Apollo 7. 1968 October 1-2 - . Launch Vehicle: Saturn V.
1968 October 2 - . 1968 October 3 - . Apollo 7 flight readiness review - . Nation: USA. Program: Apollo. Flight: Apollo 7. 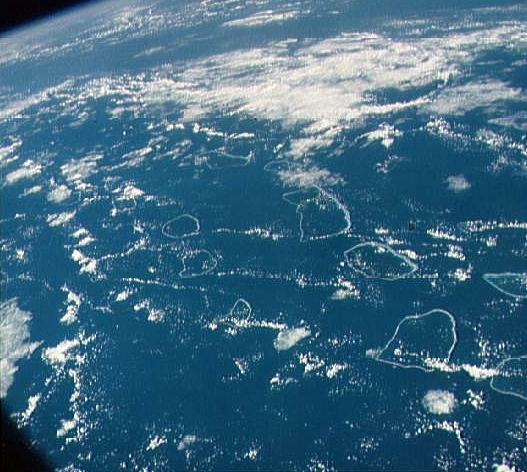 Senior management from NASA Hq. and the three manned Centers conducted the Apollo 7 flight readiness review at KSC. Crew, space vehicle, and all supporting elements were ready for flight. Countdown-to-launch sequence had started on October 6, and flight preparations were on schedule for launch readiness at 11:00 a.m. EDT on October 11. Apollo 7 CSM to Downey for postflight testing - . Nation: USA. Program: Apollo. Flight: Apollo 7. Spacecraft: Apollo CSM, CSM Block II. While the flight of Apollo 7 was still in progress, ASPO Manager George M. Low ordered that CSM 101 be returned to Downey as quickly as possible at the end of the mission to begin postflight testing as quickly as possible. Therefore, no public affairs showing of the spacecraft could be permitted. 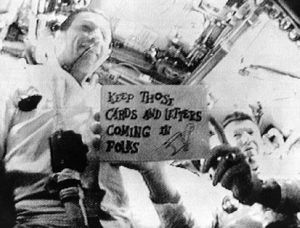 1968 October 28 - . 1968 November 8 - . Launch Vehicle: Saturn V.
1968 November 10 - . 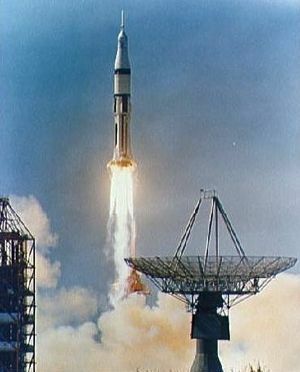 Launch Vehicle: Saturn V.
Success of Apollo 7 clears way for Apollo 8 lunar orbit mission in December. - . Nation: USA. Related Persons: Low, George. Program: Apollo. Flight: Apollo 7, Apollo 8. Spacecraft: Apollo CSM, Apollo LTA.